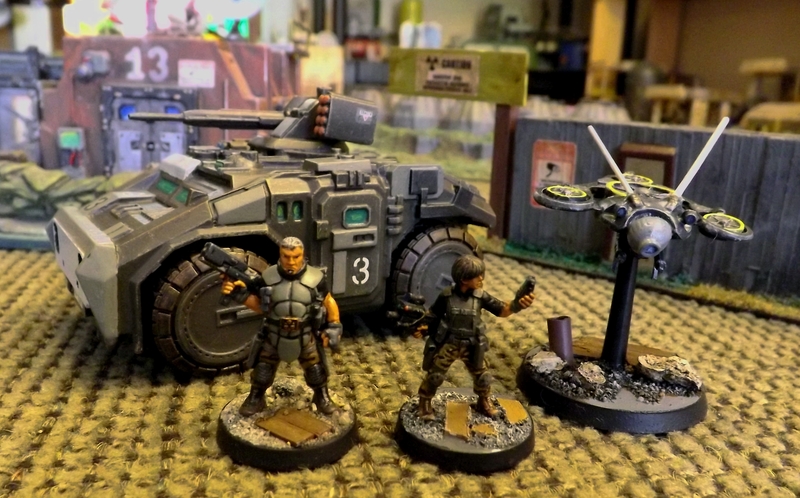 Picked up a Khurasan Miniatures Polecat Armored Utility Vehicle for my Black Friar private security team. Gorgeous little vehicle, zero bubbles, flash, mold lines. All I did was swap out the turret for something a little more low-profile and it’s ready to roll. Figs by Hasslefree, drone by RAFM. (with slight mods) A few more HF Moderns troopers and a walker-type heavy vehicle perhaps and this Skirmish Set is complete. Another Bat Rep on the way. Click for larger images. Black Friar Principles with Polecat and Switchblade aerial drone. Full crew with new ride. Excellent! HF makes outstanding figs. And speaking of C-punk, my Humanity First crew is composed entirely of HF. I’m basing them now and will post shots asap. Thanks for stopping by. Lovely stuff as ever. That Polecat is a really nice piece of kit. I have been salivating over it for a while now, but seeing it here has me very tempted. Is the drone from Khurasan too? No, Drone is from RAFM’s USX line. Minor weapon mod. The armed variants are OTT, so I scaled it down a bit. Think Ghost Recon Alpha. very good intergation of the paint scheme! I use a Polecat for AT-43, it’s a nice vehicle, and I’m curious to know if you try the light saber, in 28mm? Thanks much. Funny you should mention AT-43 – I’ve got an UNA walker to repaint next. for this crew no less. And forgive me, but ‘light saber’ ? The Jedi weapon or a vehicle? Khurasan makes the larger Caiman APC, which is out of stock and a bit over my budget at the moment. 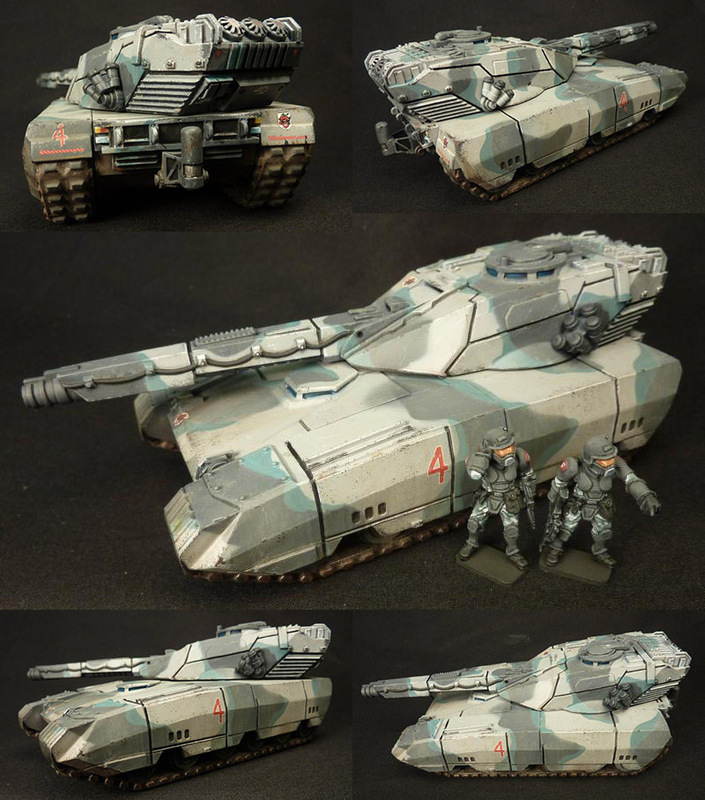 Antenociti’s Workshop makes gorgeous vehicles for 28mm. nope, it’s a light tank in 28mm http://khurasanminiatures.tripod.com/28mm-fed-sabre.jpg , called juste sabre, from Khurasan… I try to know if he’s well suited for AT-43 units. Antenociti’s 28mm are to small for me, I have four vehicles, not on scale, but very nice, true. Aahhh.. sorry. No. Don’t have one. I’m focused on 28mm skirmish games on a 4 foot x 4 foot table. Tanks and other heavy vehicles tend to dominate at that level, so I tend to use them as objectives or terrain. 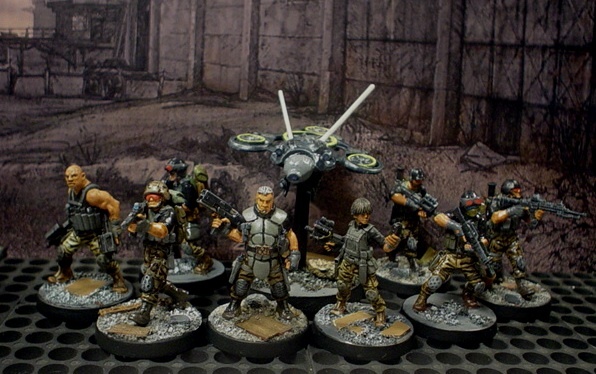 Can you put a picture (or send me) in order to compare hasslefree Bergil miniature with puppet wars troop please ? I would want to know if they are compatible !!! Sorry. I sold the PW figs a while back. Look AT COMPARISON PICTURES HERE None with HF figs but they have similar heft and dynamic. I’d say they are quite compatible in size and aesthetic. Hope that helps.